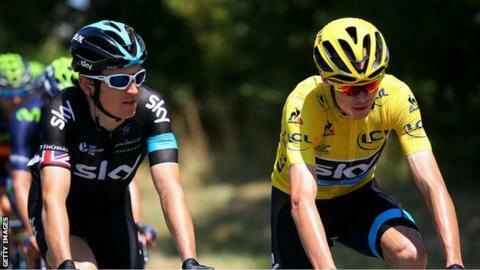 Geraint Thomas says it is a "shame" the success of Team Sky at the Tour de France has led to questions about doping. Team number one Chris Froome leads the Tour, with Welshman Thomas lying in fifth place overall. After his dominant victory on stage 10, Froome stressed he was a clean rider - a sentiment echoed by Thomas after Team Sky maintained that lead on stage 11. "It's a shame that's the way the sport is at the moment," said Thomas. "You kind of understand why in a way because of the past. But you don't see that happening if a tennis player plays really well or if a footballer is really good. "It's just a shame that if you do a good performance on a bike everyone just assumes it's in the wrong way. "That's the way it is, but we've just got to keep doing what we're doing. I've got a clean conscience and that's it." Team Sky claimed on Monday their computers had been hacked by critics convinced 30-year-old Froome is using performance-enhancing drugs. But as the team maintained their dominance - Froome leads by two minutes and 52 seconds - all the riders are coming under scrutiny. Double Olympic gold-medallist Thomas, who won road-race gold at the 2014 Commonwealth Games, says it is difficult to ignore the issue. "It's not the nicest thing to hear," Cardiff-born Thomas added. "It's the first time I've had it directed at me, but that's life and if you take to heart what every guy says about you you're not going to be very happy."